Learns and adapts quickly: e.g. how to use tools like HootSuite, nuances of posting to Google+, timing/frequency of interactions, etc. You’ll hear me say this often, but it is not important that a potential hire know all the technical stuff, procedures or your company-specific nuances. These types of “procedural” tasks can be taught. However, what IS important and what cannot be taught, is that the candidate "get" social media, is already steeped in the culture, understands what you will want with little to no explanation and – just as importantly – has accountability in their DNA. Now that you understand what you should be looking for and how this individual will fit within your organization, where do you find these highly passionate and qualified social media gurus-in-waiting? Internally: Your best candidate could be right under your nose either already working for you, or someone you know personally or professionally. Recognize your best internal candidates before looking outside your organization. Evangelists: You know what the next best thing is to someone internal? Brand aficionados! The folks that comment and evangelize your products, always leave amazing comments on your blog or social media pages, or some of your best customers. Sometimes finding a great social media manager is a matter of looking for, and reaching out to, your most passionate advocates – seriously! A great example is the Macalope. The Macalope is a fictitious being that describes himself humorously as part man, part Mac, part antelope, and writes for Macworld as well as his own blog, while culling together a loyal following. 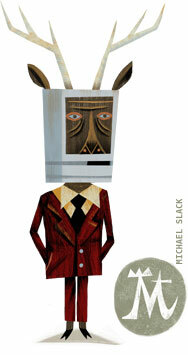 His humor, irreverence and sarcasm are contagious and pitch perfect for the target audience of Apple fanboys. Word of Mouth/Recommendations/Contacts: Another way to find talent is to mine previous contacts of people that have impressed you in the past, solicit recommendations from colleagues you respect, and put initial feelers out to trusted individuals that can spread the word for your company. Social Media: Use LinkedIn, Twitter, Facebook, etc. to get the message out that you’re hiring. This is a great way to tap into your brand evangelists while also leveraging word of mouth. Internships: There are always hungry, savvy people looking for internships – whether they are starting a new career, or college students looking for a summer gig or full-time internship that could become their next career. Some great sites and places to find interns are: craigslist.org, your local online college job boards, Internships.com and other sites. Freelance and Job Posting Sites: Some of these options include: LinkedIn Jobs, upwork.com, Guru.com, Craigslist.org, Monster.com, CareerBuilder.com, Indeed.com, SimplyHired.com and other related job posting sites. I want to mention that no matter what route you take, your position has to be congruent with your company’s expectations, goals, values, culture and vision. It also has to attract the right person. When you craft the description of the type of social media manager you’re looking for and their responsibilities – by the way, you better take at LEAST a good hour or two to do this – you also need to carefully convey the benefits to the candidate of considering your company for their next career stop. If you craft a boring, staid or quickly-put-together traditional job posting, guess what you’ll attract? Job seekers that won’t even read it and simply dump their resume in your lap. Would you want to work for a company that seems dull or boring, and didn’t take the time to sell you on how awesome it is working with them on a daily basis? Or perhaps how cool it is interacting with their loyal, passionate clients and customers, or their fantastic products and services? Don’t think that quickly slapping together a job posting will bring hoards of amazing candidates to you – especially if you are a small company! Sure Google, Facebook, Apple or other large companies can get away with that sort of thing and still attract high-end talent, but if you happen not to be a Fortune 1000 company, then you’ve got to sell the benefits of working for your organization to a hot, prospective social media rock star that doesn’t want to work for Google, Facebook or Apple! I say “fun” facetiously because no matter what, you’re likely going to get bombarded by a lot of pure “job” seekers and those that didn’t read the position description and are clearly neither qualified, nor appropriate for the position. This is where a carefully implemented pre-screening process can save you countless time and resources, while delivering pre-qualified candidates that are hungry to be a part of your team. There are 2 phases to the pre-screening process to help you weed out unqualified candidates – assuming you’ve already taken at least 1-2 hours to carefully craft an enticing and thorough social media manager description. First, ask for a specific subject line when they apply: This is so simple and effective it’s incredible. I’ve used this tactic to weed out those that are just copying and pasting resumes and emailing them out to every listing. What you do is ask for a specific subject line that cannot be guessed and is completely unrelated to the job opening. I have asked candidates to put the word “Elephant” – and nothing else –in the subject of their email or else we wouldn’t even consider their application. The moment you get any other subject line, press the "delete" button. Think of it this way: Do you honestly want a social media “strategist” working for your company that didn’t take the time, and isn’t thorough enough, to at least fully READ your instructions before applying for the position? 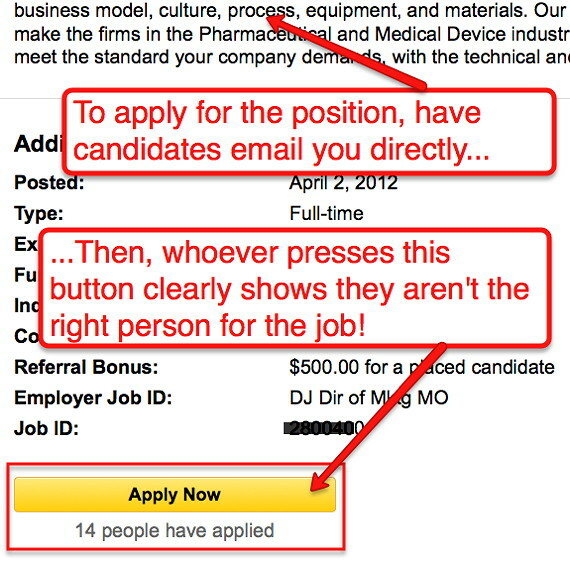 Tip: If you use a job posting site that let’s applicants apply directly through the website, simply state in your description that an email must be sent in lieu of applying through the website. If you get applications through the website, it means they didn’t thoroughly read the instructions and you can delete their information. Bonus Tip: Burry these instructions within your listing (preferably in the middle of a non-related paragraph of text), so it is not easily found by scanning the page! Second, ask the candidate to answer 3 – 5 questions: This is another great way to weed out candidates right off the bat. If they did happen to see your subject line requirements, another subset of candidates will drop off the hunt once they see there is actual work involved to even be considered for the position. What types of questions do you ask? The type that let them stand out from the crowd and be expressive. After all, you are hiring a SOCIAL media manger right? What 3 things are you most passionate about? Explain each. Tell me about and show me something you worked on or created over the last 6 months that was difficult to accomplish that you are proud of. Show me 3 social media campaigns you’ve worked on and explain what results you achieved for each – not the WORK you did, but RESULTS you achieved. Assume that money is no object and you are financially independent. What does your typical day look like? Explain which is most important to you: Getting it right or explaining it right? Why? Give me an example of how you overcame adversity in your life. Choose ONE company you respect. Explain to me why you respect them and then tell me 5 things they must do immediately to dramatically improve their social media presence. As you can see, some of these questions are open-ended and a bit interpretive, but that’s the point. You want to see the candidate’s thought process and how they react to strange or open-ended questions while also allowing you a chance to really get to know them on a deeper level as they explain some of their passions in life, what they value, and how they interact with the world around them. This process will weed out those that aren’t really serious about joining your team, are to lazy to fill out the required information, or those that answered in such a way that you can immediately exclude them from future consideration. After the preliminary pre-screening requirements you’ve implemented, you’re likely now left with some very special people that you are interested in talking to that are skilled, passionate, detail-oriented and accountable. Now let’s take that one step further with a preliminary phone screen and task list to make finding your ideal social media expert even easier. These tasks should be a mix of challenging items that they are likely never to have done before, combined with some that they should already know how to do. It isn't important if they complete the tasks with 100% accuracy. Always remember that you can teach technical stuff that someone might not know, as well as your internal systems and procedures. What IS important, however, is to see their thought process and their accountability in action. Did they give up or keep trying? Did they admit if they couldn't figure something out? Did they find the information they needed to complete the task? Did they try their best? Was there heart, soul and polish in their work? Finally, these tasks should also show the candidate’s ability to problem solve without being told how to do something – a very important skill to have in the rapidly changing world of social media! Learning how to use a new piece of software, application or tool without showing them how, and asking for specific results – make sure they’ve never used it before! You must make it clear that all assigned tasks must be completed within 24 hours from when you hang up the phone with them, or 24 hours from when they received a follow-up email from you outlining the tasks. If the candidate really didn’t want the position, isn’t willing to work hard to get it, or they could not handle the expected workload, they simply disappear and you’ll never hear from them again. It’s better to find this out early rather than too late. In fact, if this does happen, you just saved your company from making the mistake of hiring someone that would have bailed on you when the going got tough. On the other hand, the candidates that really want to join your team will drop everything to complete these tasks as best they can. In the world of social media you sometimes need to accomplish tasks on the fly and nobody will be there to show you how to do them. Therefore, it's important to hire someone that is autonomous and able to think for themselves. It bears repeating that you aren’t looking for perfection with these tasks, but rather want to see the candidate’s thought process, problem solving skills and ability to learn something new without being taught how to do it. 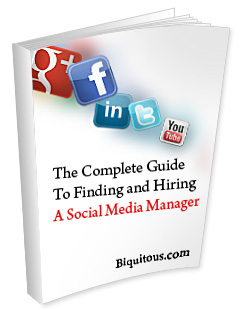 By this point you’ve successfully narrowed your search for the ideal social media manager to only the very best, brightest and hungriest candidates that see working for you as a great opportunity, not just a job. Let’s finalize this process by interviewing your candidates in person and presenting them with a few more tasks to see what they’re made of. There’s nothing like being on the spot and seeing how someone handles challenging tasks with potential coworkers or your potential boss breathing down your neck! The in-person interview is used for two purposes: to make sure that the candidate is the right fit for your company in terms of personality, demeanor and culture, and that they know their stuff or at least are capable of learning what they don’t know quickly. Tip: If your candidate works remotely, sometimes an in-person interview is not possible, or entirely necessary – especially for a social media position. Compensate by adding one more round of higher-level tasks and/or interviews to firmly lock down the right person. Remember: Learning how to create a Google+ page, best practices for creating a Facebook tab, or the best times of the day to Tweet can be taught. What can’t are the intangibles of someone being able to interact with an audience on the fly, learn things quickly, be accountable and bring passion to whatever they do! Super Bonus Tip: At the end of the day it’s all about results. So, have the candidate detail what they will accomplish for your company within the first 90 days of working for you. Not actions they will take, but RESULTS they will achieve! You can even give them a day or two to think about this, brainstorm and come up with what will be essentially, their hiring contract with you. This final step is almost anticlimactic. After the process you just implemented and the steps you set up to ensure you attracted the right person for your organization with the perfect skill set, your decision to hire them is the easy part. By now you know exactly whom you want – a rock star social media manager will emerge – and all you have to do is pull the trigger. 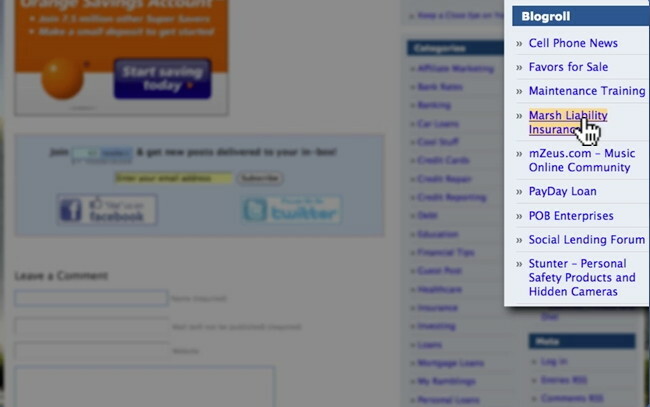 Tip: Here’s a range of social media salaries and job titles from Onward Search to help you out. Social media manager is the most common (and searched for) description for what you probably need, but other titles exist like “social media specialist”. You are free to decide which nomenclature fits what you are looking for and then create a position description and decide on compensation accordingly. Bonus Tip: Make sure you always hire on a trial basis – using the 90-day plan your candidate created for you as a framework for whether they are delivering results or not – because no matter how thorough a pre-screening and interview process is, someone might still turn out to not be the right fit for the position. Quick Warning: If you’re thinking for one second that this process is too laborious or difficult for your company, then by all means feel free to do it your way and see how much time, money and rework it’s going to cost your organization when you have to find, hire and train someone new for the position every couple of months! Finding and hiring an amazing social media manager isn’t as difficult as it sounds if you’ve got a sound, repeatable strategy in place to ensure that you only attract the right candidates. By using this system you will now ensure a much higher accuracy in finding the absolute best social media managers looking for their opportunity to shine. Always remember that there are inherent traits that you should look for and others that can be taught. Knowing the difference is the key to locking up an amazing, talented, passionate and devoted person who will live and breathe your company’s social media presence. If you feel I missed something I would love to hear your thoughts in the comments below. This is a really well thought out post - a must for busy business leaders serious about making a great social media hire. Thanks for sharing Chris. More and more companies are hiring virtual help. This can save a company time and money. Thank you much for such excellent -detailed guidance. However, I think knowledge and innovation are the most important skills a candidate of this position should have. it is not how many years of experience or type of qualification, but communication and creativity in attracting customers in the best manner.